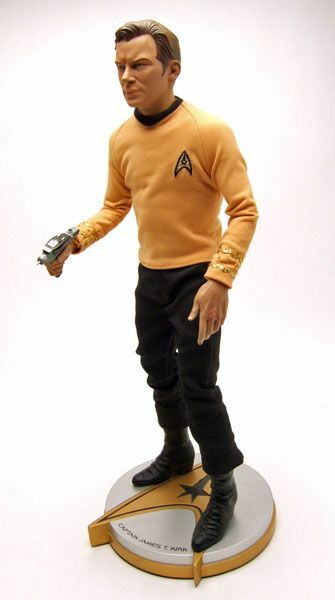 Sideshow produced this Kirk in 2005 (I think) at a limited edition of only 1000 pieces. 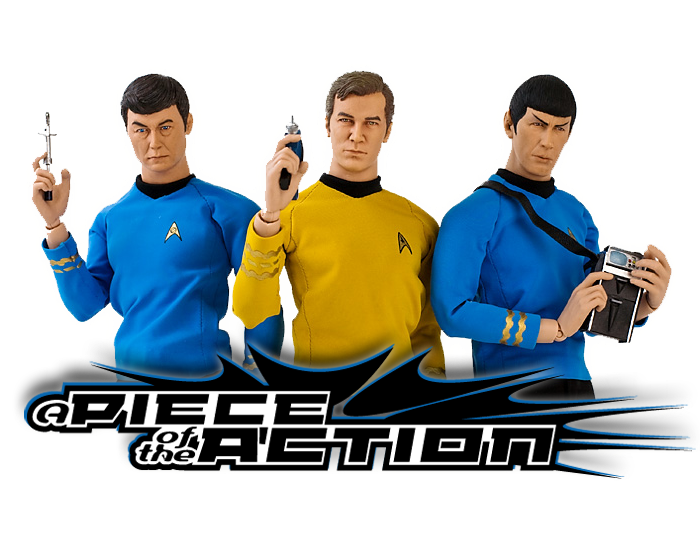 The Rundown: For those unfamiliar with Sideshow's Premium Format line, the figures are basically 1/4 scale statues. 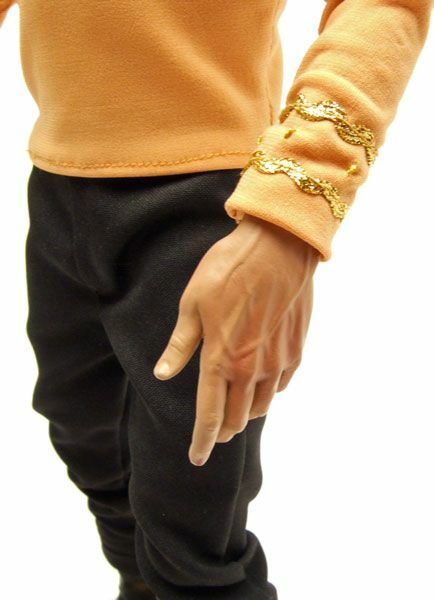 They are usually composed of mixed media (polystone, plastic, cloth, etc) and aren't really articulated. 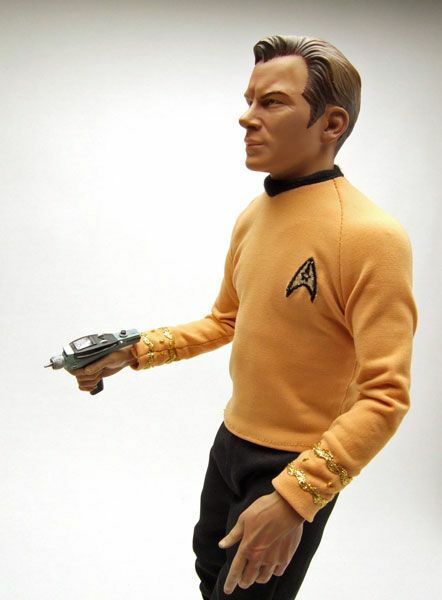 Kirk (& Spock) were released pretty early in the Premium Format line, so like most of the early PF's they do have some movement in the arms due to a wire aperture built inside. 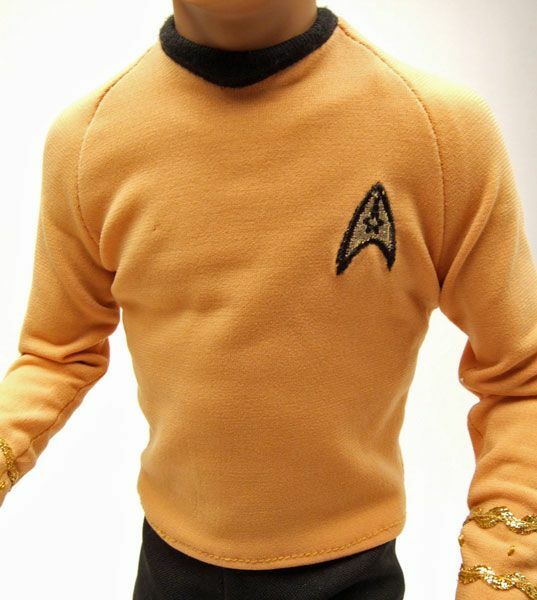 When I first saw pics of these back when they were first solicited, I passed. At $200 a piece, I felt the quality just wasn't there. 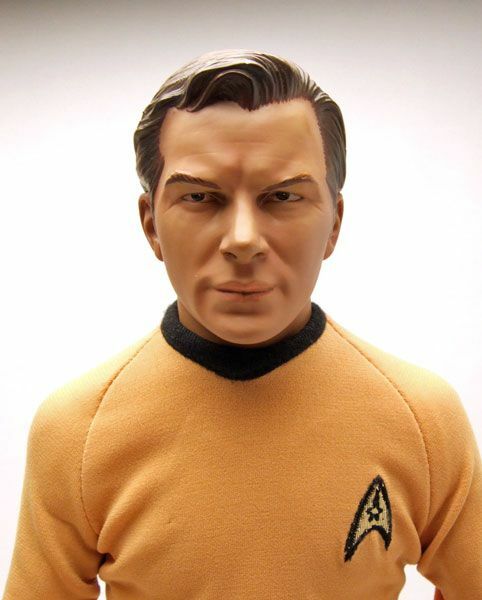 The heads looked really large in the promotional material, and the likenesses weren't all that impressive. A pretty big disappointment since I thought Sideshow was going to do great things with the license. 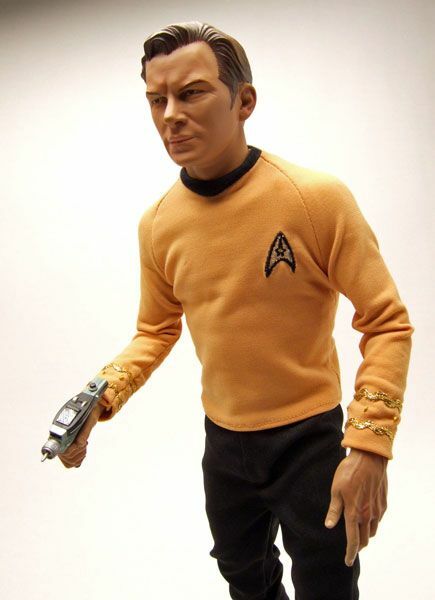 Instead, we just got some busts and a few Premium format figures. 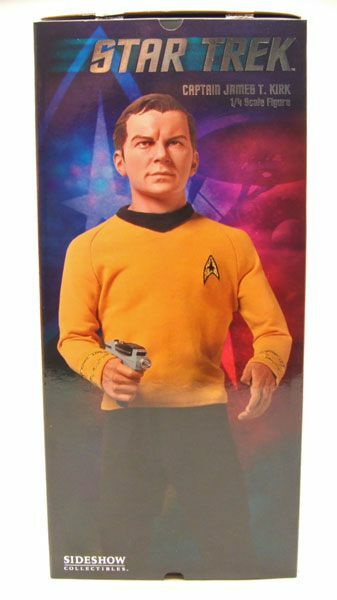 Eventually, my desire for nice, large display pieces for my collection won out, and I picked up both Kirk and Spock. I actually like them much more in person than I thought I would. That's not to say they are flawless, but they are much better than Sideshow's photography makes them out to be. That looks much closer! Oh, and the head seems a bit large in photography. While it's still not perfect, it does seem more proportionate in person. I guess that's just lost in 2D pictures..
...and the rank braids are pretty well done too! 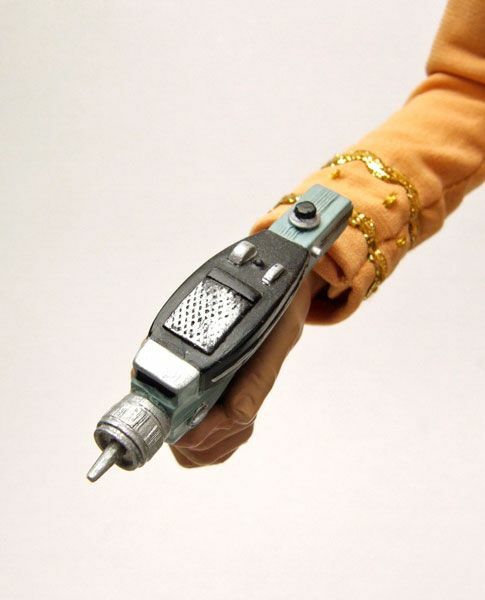 Good detailing in the hand sculpt there too. 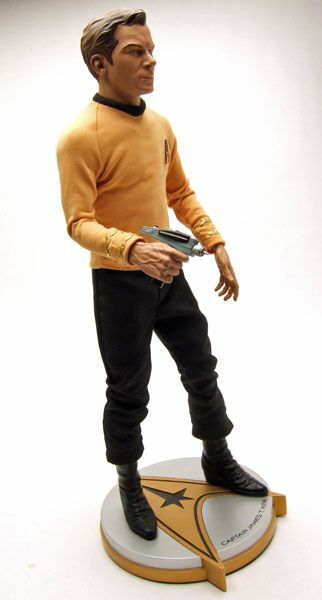 Kirk comes with a phaser stuck in his hand. The sculpt is nice and the paint is fairly clean. I haven't ever tried yanking it out of there so I couldn't tell you if it's removable or not. 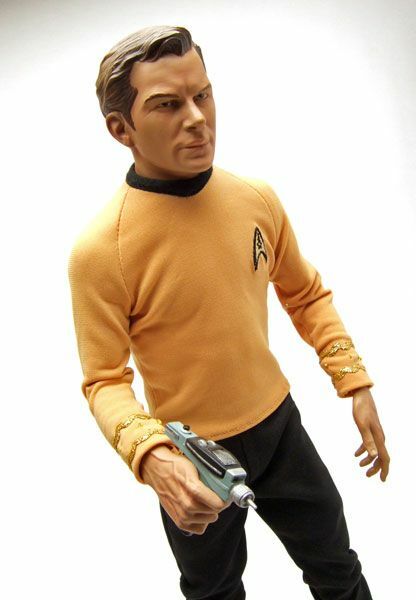 Kirk plugs into his polystone base using 2 posts at the bottom of his feet. 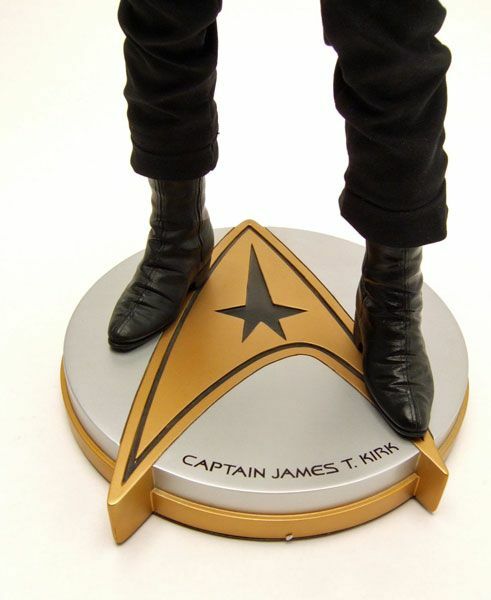 The base is nicely done, with Kirk's name printed on the front. The bottom of the base has the item number and the name of the sculptor printed on it. 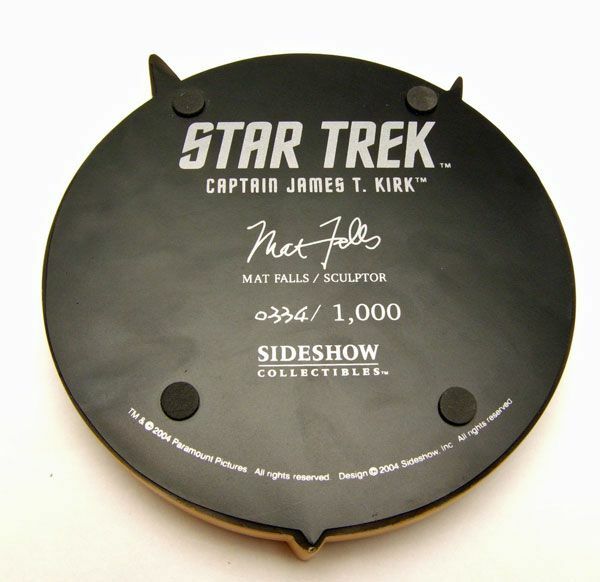 In Kirk's case, Matt Falls was responsible for the sculpting duties. ...and that's Kirk's box bio if you'd like to give it a read.